Ukraïns’ki visti [«Українські вісті»; Ukrainian News]. A newspaper published weekly (at times semimonthly) in Neu-Ulm, West Germany, from November 1945 to May 1978 and in Detroit from August 1978 to May 2000. 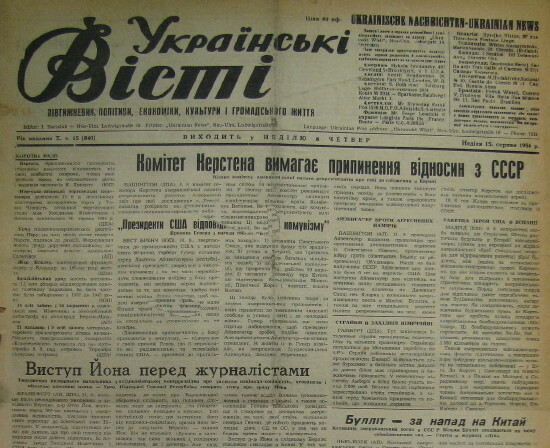 It was closely allied with the postwar émigré Ukrainian Revolutionary Democratic party, and briefly published its ideological organ Nashi pozytsiï. The paper contained articles on politics, economics, culture, and community affairs. It devoted particular attention to developments in Soviet Ukraine. Until the 1960s it supported the Ukrainian National Council. In 1953 it published a semimonthly Russian-language supplement, Osvobozhdenie, edited by Grigorii Aleksinsky. It also published sections devoted to the Plast Ukrainian Youth Association, the Petliura Legion (veterans of the Army of the Ukrainian National Republic), the Ukrainian Democratic Youth Association, and arts and culture. In 1986 it had a circulation of approximately 1,500. The initiator of the paper and a longtime chief editor (1946–7, 1954, 1957–62) was Ivan Bahriany. Other chief editors have included P. Maliar (1945), Yurii Lavrinenko (1948), Mykhailo Voskobiinyk (1949), A. Romashko (1950–3), V. Bender (1955–6), V. Miniailo, A. Hlynin (1963–74), Fedir Haienko (1975–8), M. Smyk (1978–94), and Serhii Kozak (1994–2000).